Edward Mujica entered the season as a solid middle reliever/setup man but quickly found himself thrust into the closer's role after Jason Motte went down with Tommy John surgery and Mitchell Boggs collapsed as Motte's successor. Many felt the ninth inning should go to flamethrowing 22-year-old Trevor Rosenthal, but Mujica silenced critics for much of the season by thriving in the role and upping his free agent stock accordingly. Few things in baseball are more frustrating than watching a relief pitcher come in and issue multiple walks; that's something Mujica's managers, teammates and fans virtually never have to worry about. Over the past four seasons, Mujica has allowed 37 walks in 275 2/3 innings (1.21 BB/9), but nine of those were intentional. Mujica will put a batter aboard via an unintentional free pass about once every 10 innings. As such, he has a pristine 1.001 WHIP dating back to 2010. The only "free agent" reliever who really comes close to matching Mujica in control is Mariano Rivera, and he won't be signing anywhere this winter. Over that same four-year stretch, Mujica has a 47.2 percent ground-ball rate, and opponents are batting just .230 against him. Put simply, Mujica does a better job at keeping hitters off the basepaths than most relievers in the game. Mujica earned just $3.2MM this season, so a qualifying offer would be a tremendous increase in his salary and is therefore highly unlikely. He won't come tied to draft pick compensation, and at age 29, he's one of the youngest free agent relievers on the market. He's also highly durable, having just one DL stint throughout his big league career; that injury was the result of a broken toe suffered when he was struck by a batted ball. The average big league reliever has averaged about eight strikeouts per nine innings over the past four seasons. Mujica has, in turn, whiffed 7.4 hitters per nine innings over that four-year stretch and has dropped to 6.4 strikeouts per nine frames in 2013 (while the MLB average for relievers has risen to 8.3). His low punchout total is a bit curious given his well above-average swinging strike rate (12.5 percent in 2013 and 11 percent for his career). Advanced metrics like FIP (3.71), xFIP (3.53) and SIERA (3.25) don't necessarily back up Mujica's 2.78 ERA. His .263 BABIP is unusually low, although it's fair to wonder if it's actually a sustainable mark; he's had a BABIP south of .270 in each of the past four seasons. If that's the case, then it's likely that sabermetric stats undervalue him, as they measure him against the league average rather than his own career norms. Perhaps the biggest knock on Mujica is his poor finish to the season. He carried a 1.73 ERA into September but crumbled in the season's final month, allowing nine runs on 18 hits and a pair of walks over his final 7 1/3 innings. That prolonged meltdown knocked him out of the team's closer spot will likely be brought up in contract discussions this offseason. Mujica and his wife, Erika, reside in Yagua, Venezuela, per the Cardinals's media guide. The couple welcomed their first child, Brianna, into the world in July 2012. Mujica is often described as fun-loving, doing things like making custom t-shirts for his teammates with the Marlins to keep the clubhouse light (per MLB.com's Joe Frisaro). Many teams will be on the lookout for bullpen help this winter, and Mujica is one of the handful of available relievers that will come with ninth inning experience. While many maintain that ninth inning experience isn't a prerequisite for closers ("closers are made, not born"), Mujica's agent, Wil Polidor of Octagon, can boast that his client racked up 37 saves in his first season as a closer and should be compensated for that big number. Teams don't pay for saves quite as much as they did a few years ago, but there are still old-school general managers and front offices that want to hand the ball to a guy who's "been there before" in the ninth inning. The Tigers, Rangers, Rays, Yankees, A's and Cubs will all lose their closers to free agency or retirement this winter. Other teams like the Mariners, Brewers, Diamondbacks and Indians have seen great uncertainty in their late-inning situations this season. 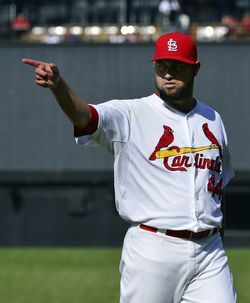 The Cardinals could also express interest in retaining Mujica, though with Motte on the mend and Rosenthal pitching well of late, he may not have an opportunity to regain the closer role in St. Louis. Of course, there will also be plenty of teams with closers in place who will look to Mujica as a reliable, durable setup man. Mujica is the same age that Brandon League was when he signed his three-year, $22.5MM contract with the Dodgers last offseason. While that's proven to be an overpay, that didn't deter the Reds from giving another under-30 reliever, Jonathan Broxton, a similar three-year, $21MM contract a few months later. Neither of those relievers boasted lofty strikeout rates in their walk seasons, and I imagine that will be Polidor's target for Mujica, while the three-year, $16.5MM deal that Joaquin Benoit signed prior to the 2011 season will be the floor. Back in May, I looked at Mujica's free agent stock and noted that a strong season in the ninth inning couls land him a deal similar to Broxton's. Despite his slide at the end of the season, I believe that a three-year, $21MM deal remains a reasonable expectation given his youth, durability, elite command and strong track record.